Smaller, lighter, cheaper but not universally better. When most of us think about Nintendo hardware, we think about the gimmick. The motion controls of the Wii, the second screen of the Nintendo DS, the stereoscopic visuals of the 3DS and the duality of the Nintendo Switch. These innovations define Nintendo's brand -- but it's not the only hallmark of Nintendo hardware. The company is as much of a house of iteration as it is innovation, particularly when it comes to portable gaming. Almost every one of its handheld consoles -- from the original GameBoy to the Nintendo DS -- has been revised, retooled and released in a new form. Nintendo has made five versions of its original 3DS hardware, and it's about to release one more: The New Nintendo 2DS XL. The New Nintendo 2DS XL isn't the best portable gaming console in the 3DS family, but if you don't care about the handheld's namesake stereoscopic effect or mind having a slightly shorter battery life, it's a great way to play Nintendo's excellent library of portable games. Be the first to review the New 2DS XL? If the name sounds familiar, it should -- two years ago Nintendo released two revised 3DS models (in both standard and XL sizes) with Amiibo support, a faster processor, a second analog input and face tracking features to help stabilize and improve the 3D effect. The New Nintendo 2DS is basically a revised version of that handheld with one primary, obvious difference: it doesn't play games in 3D. This isn't the first time Nintendo dropped the stereoscopic handheld's namesake feature. 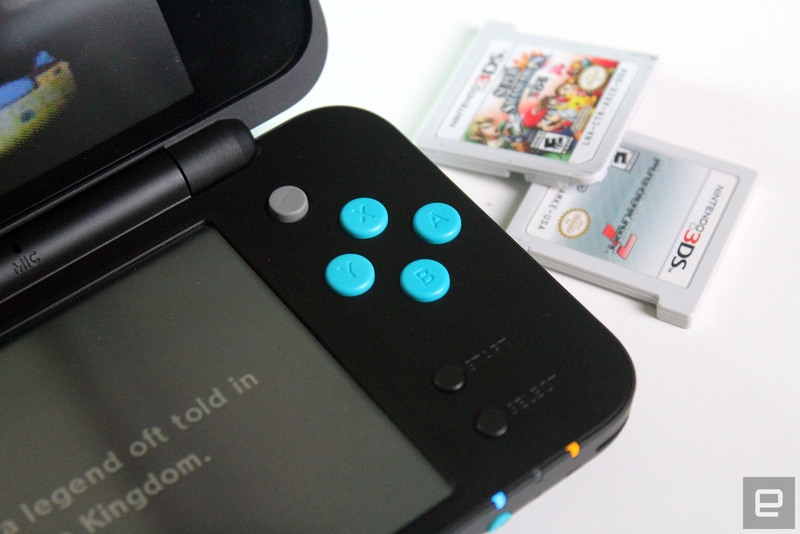 The original 2DS traded in both the 3D gimmick and the traditional clamshell design for a sturdier body and lower price-point. Likewise, the new model forgoes the 3DS' digital depth perception and passes the savings on to the consumer -- and this time, it retains the iconic hinged design. Nintendo didn't just copy the New Nintendo 3DS' design and turn off the stereoscopic screen, however -- this is a completely new chassis. In fact, the New Nintendo 2DS XL is the smallest large-screen portable Nintendo has ever made. It still has the same 4.88-inch primary display as other XL models, but its footprint is a quarter inch shorter than the 3DS XL. 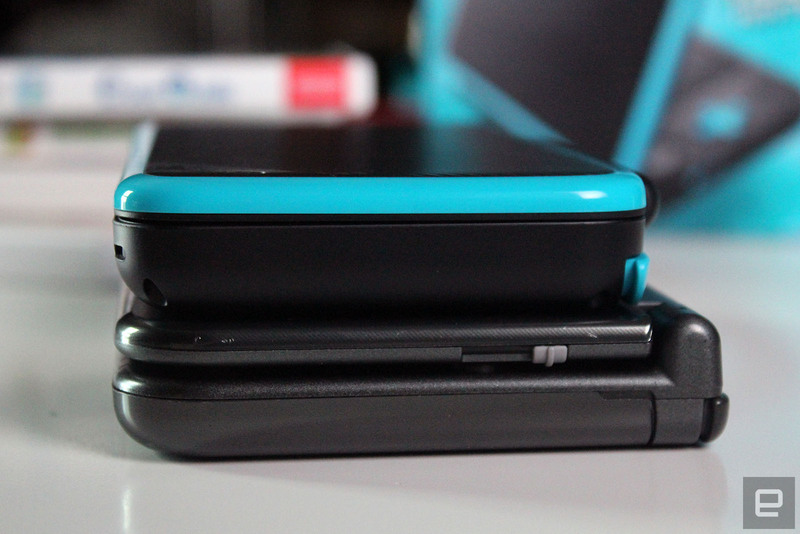 Despite the smaller size, the 2DS XL feels roomier. Smaller bezels around the screen and a repositioned hinge allowed Nintendo to move the controls down a few millimeters. It's a seemingly small change, but it adds just enough space above the right-hand analog stick to keep my thumb from brushing up against the hinge. It's little refinements like this that make the New 2DS XL special. Minor tweaks to the shape of the shoulder buttons that make them just a little bit more comfortable. The matte, fingerprint resistant texture on the back of the handheld's lid. The small, flexible door that protects the cartridge slot. Nintendo even moved the microSD card reader to an easily accessible slot next to the cartridge port -- making it possible to transfer screenshots and photos without removing the handheld's battery cover. The streamlined 2DS design answers almost all of my minor complaints with the New 3DS XL... but that doesn't mean it's better than Nintendo's fully fledged portable. There's a lot to love about the 2DS XL, but it definitely has its flaws. The console's stylus, for instance, measures just two and a half inches -- making it just barely long enough to be useable, but short enough to be frustrating for any game that requires drawing or heavy touchscreen use. The console's speakers are a disappointment, too. 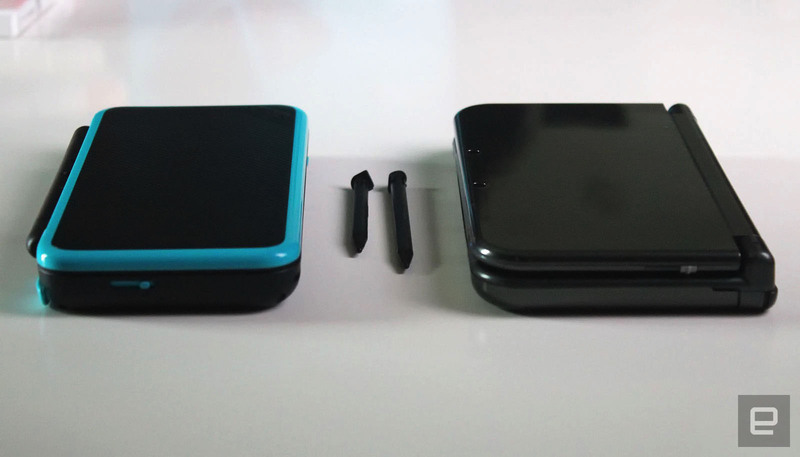 The New Nintendo 2DS XL is not only quieter than its 3D counterpart, but the speakers have been moved from the top screen, where they faced the player, to the console's bottom edge. This doesn't just muffle the handheld's sound output, but at higher volumes you can actually feel the audio vibrate through the controls. It's a little weird. Mediocre audio and a short stylus are mildly disappointing, but they both qualify as manageable shortcomings. If the 2DS XL has a real fault, it's battery life. In my standard battery test (an endless CPU battle in Super Smash Bros with console brightness set to minimum, battery saver activated and WiFi disabled) the 2DS XL lasted just six and a half hours. That's not terrible for a modern handheld, but it's an hour and a half less playtime than the New Nintendo 3DS XL managed in the same test. Hardware foibles aside, playing the 2DS XL isn't inherently different from other Nintendo handhelds. 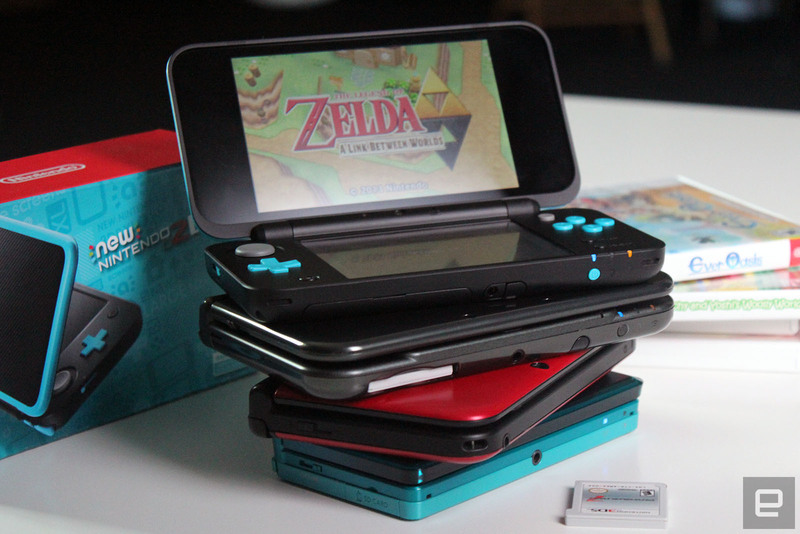 It uses the same operating system as other 3DS consoles, has the same controls and plays all the same games. It even still has two cameras for taking 3D photos -- you just can't see the results on the 2DS' own screen. At worst, this makes a few optical illusion-based puzzles in games like Super Mario 3D Land a tiny bit harder to decipher, but it doesn't render any game unplayable. If you don't already own a handheld in the Nintendo 3DS family and you don't care about the console's namesake gimmick, the 2DS XL is a good option. It's $50 less than the fully fledged New Nintendo 3DS XL, plays all the same games, and has the bonus of being lighter and smaller. If you've been waiting for a revision that adds up to being a "3DS lite," this is as close as you're going to get. Unfortunately, "lite" isn't always best. The 3DS family of consoles is entering its twilight years, and this very may well be the last hardware revision the handheld receives. If you're buying your first 3DS handheld and want the absolute best experience, invest the extra $50 in the fully fledged New Nintendo 3DS XL. Not just because it can still pull off Nintendo's stereoscopic gaming gimmick (though that is nice), but because it has notably longer battery life and offers a significantly better audio experience. If you just want access to Nintendo's portable game library for a good price, however, go ahead and look at the New Nintendo 2DS XL. It's not perfect, but it's exactly what it promises to be. That's enough.